"Faster, faster!" That's what my kids always yell. Did you ever think that they might be able to go faster without you pushing faster? We relish spending time at a little treasure of a neighborhood park near our home. The merri-go-round is Pony Artist's favorite, and I love that she can enjoy it-- even in the twenty-tens. I hope that whoever doesn't put merri-go-rounds on modern play grounds doesn't find us. I love watching my kids enjoy the sensation of spinning until they're dizzy, and physical play is a critical part of childhood! One late summer afternoon, the Pony Artist was happily spinning, and I asked her whether she went faster when she was in the middle or on the edge. Pony Artist chose "in the middle". In a sense, she might have been right. The merri-go-round itself does probably spin faster with all the weight on the middle of the platform. Once the frame is spinning and the rider aboard, the active force is friction taking away the momentum. Putting a rider on the outside edge tilts the frame, making it push down harder on the center bearing. The harder it pushes, the more friction is generated to slow the merri-go-round. I don't want to be to quick to criticize her intuitive response. Science is about observation, not predetermined conclusions. Hers wasn't the standard mathematical answer though. Usually in physics class, we assume the merri-go -round spins at the same speed no matter where the riders are. Maybe if keep working out I'll be able to spin them just as fast no matter where they sit. If the merri-go-round itself goes just as fast no no matter where you sit, then you get the fastest ride on the edge of the merri-go round because you go further each time it spins. To picture this, think about a rope laying around the edge, and a rope just enclosing the center. The rope on the inside is shorter, and your ride will be too if you are on the inside. If you went a short distance while my daughter went a long distance, she was faster. 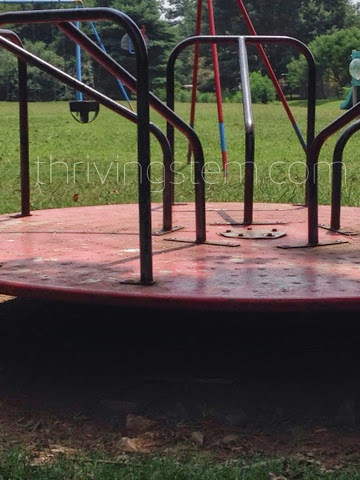 So, if your kids are yelling "faster, faster", it might be worth moving them to the edge of the merri-go-round.